Compact, yet with a spacious and high quality interior, the Sheerline 820 Sedan, designed by Andrew Wolstenholme, provides an excellent introduction to inland waterway cruising. 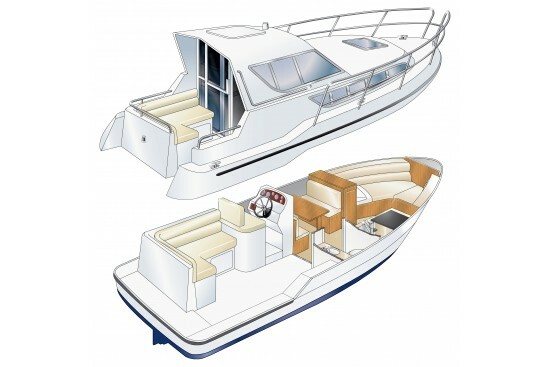 The aft cockpit area has L-shaped seating and leads on to the helm position with a double helm seat. Forward are the saloon with extremely good headroom and a large comfortable dinette with table that converts to a double berth. A seperate mid cabin has a large berth, dressing table and wardrobe. The toilet compartment incorporating a shower and a fully fitted galley complete this comfortable and convenient package.